Horse stalls are fine for eating, sleeping, and grooming, but horses get restless and bored staying in their stalls all day waiting for their owners to groom or ride them. They need exercise and play to relieve them from what equine veterinarians call 'stall stress.' Here are some of the best boredom-relief horse toys you can buy! 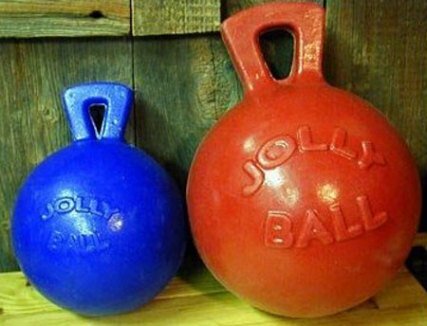 A very popular horse product is the Jolly Ball, usually the 10" ball - that's the largest. 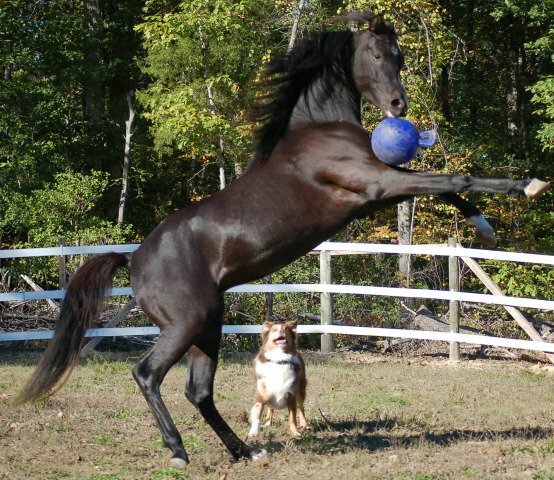 But your horse may have some competition for the ball if you have dogs; they like to play with the Jolly Ball too. Though a great toy in the pasture, Jolly Ball is a good stall toy too - because it fits! The Jolly Ball Horse Toy is available from Amazon.com in five bright colors. The manufacturer states it will not pop or deflate! Equi-Spirit makes one of the most highly recommended horse balls, and judging from its horse fans, including some very famous race horses, the Equi-Spirit balls sure are fun for them. They come in several sizes from 25" to 40" in diameter. The best thing about these balls is that they are built to last, with an inner and outer bladder made of strong materials. And even though some horses (and steers, dogs, and other animals that may get near one) try their best to burst the Equi-Spirit balls, it's pretty hard to do. But they all love it! 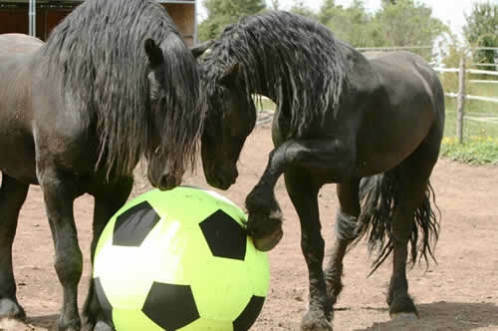 Visit Natural Horse Talk to check out more great photos and videos of horses (and other large animals) playing with the Equi-Ball. You can purchase the Equi-Balls here. No doubt your horse will get some action chasing this oversized spool around. But the secret to the Amazing Graze's lasting power is reportedly the amount of hay you stuff over the yummy treats inside the hollow spool. You have to provide some challenge to your horse, of course. That being said, horse owners rate Amazing Graze very highly, some saying it's a surprisingly entertaining toy for their horses. Amazing Graze is available at Amazon.com. You can hang the Horseman's Pride Scented Jolly Ball right in your horse's stall. It is made from a durable plastic, but it emits the smell of .... bubble gum! Why horses seem to like the smell of bubble gum is beyond me, but this horse toy is very hightly rated on Amazon. Horses seem to love licking and nibbling on the Jolly Ball, and it keeps them from other destructive nibbling in their stalls. This little 'sucker' may not look like much, but it will keep your horse busy. There are two holders in the Boredom Breaker kit for the apple, mint, banana, molasses, or carrot flavored glucose inserts. The challenge for your horse is reportedly high, especially if she likes the flavors you've chosen, so it will keep her busy for awhile in her stall. Get the Likit Boredom Breaker here at Amazon.com. These treat balls are very popular horse toys. They are mostly sugars mixed with some grains and vegetables, but they also contain several mineral supplements that horses need. Uncle Jimmy's Hanging Balls are about 5.5 inches in diameter and can be hung in the stall or from a tree in the pasture (but deer and cattle also love these little balls, so keep that in mind). The flavors sound yummy: apple, sweet and salty, molasses, and peppermint! Amazon customers review this product very highly and say it does relieve stall boredom. Salt, as you may know, is an essential mineral for all livestock and horses, and this particular salt is hard rock, so it is not easy for horses to bite it into pieces, as they do with pressed salt blocks. The Indus Classic Himalayan Hanging Salt Lick is chemical-free and approved by the FDA. Great reviews on Amazon keep it selling. Some of the round treat balls for horses spill out treats too readily so they are not enough challenge for horses, but the Nose-It Funnel Fill Horse Treat Ball Toy gets plenty of compliments on its patented design that makes it more challenging for horses to play with and, thereby, get treats. 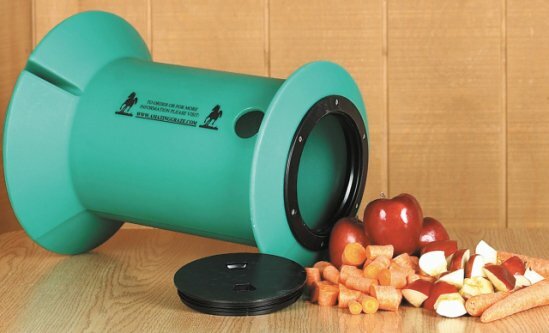 It holds up to six pounds of pelleted feed, hay cubes, or treats. The question: Will your horse share it with your dogs? Yes, you can buy this for your dog, too! The Nose-It Funnel Fill Horse Treat Ball Toy can be found on Amazon.com or DoverSaddlery.com. With one, more, or all of these great horse toys, your horse will remain active as well as calm, even when you're not around. That's the hay for today!